Rose Blossom Legacies: Special Pre-Fourth of July Sale in Honor of You! Special Pre-Fourth of July Sale in Honor of You! I am so appreciative of you - my blog readers and customers! Without you, and your love of Close To My Heart products, I would not have a business. I am blessed to be able to share Close To My Heart in your homes, in my classes, and through this place in blogland. It is truly a joy to read your messages, e-mails and to hear your enthusiasm for Close To My Heart product! I feel very honored to be able to do what I love and to continually bring ideas that fit into your paper crafting life! So with that being said, I am having a sale that starts today and goes through the end of the month - June 30th. 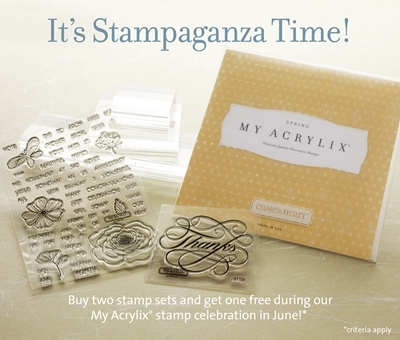 I've told you already that it's STAMPAGANZA month (buy any two stamp sets, get one free!). I have a special offer for you that coincides with STAMPAGANZA! So listen carfeully! When you purchase two e-sized (value $29.95) or d-sized stamp sets (value $17.95), you will get a FREE STAMP SET from Close To My Heart, and I am going to give you a FREE PAPER PACKET of your choice! That's an additional value of $9.95! When you purchase two c-sized stamp sets (value $13.95) or b-sized stamp sets (value $9.95), you will get a FREE STAMP SET from Close To My Heart, and I am going to give you a FREE STAMP PAD of your choice! That's an additional value of $5.25! Whether you are a seasoned Close To My Heart customer or venturing into trying Close To My Heart product for the very first time, this is a great way to get a lot of product at a very reasonable price! Don't have an Idea Book? That's okay - you can look at a beautiful copy online on my website. In order to get this sale from me, you will have to send me an e-mail (girlygirlrose43@msn.com) or call me (763-227-0583) with your order. I'll quickly get you your total with shipping and tax, and you can either send me a check or I can send you an online invoice. I want you to have that little "extra" to thank you for the big amount of "extra" that you add to my life! Thank you so much, and I hope you enjoy the sale! !